1. Magnetic safety coupling: Specially designed magnet releases in case of shock load, but holds tight under normal tugging weight. The coupling provides 360 degree rotation, which allows the leg strap to come to rest without twisting, and still tugs from the centerline. It also provides a convenient detachment point. 2. Urination : All ADI devices provide capability for urination. Wearer can urinate unencumbered while wearing the device, no spraying, or leaks. And you will never worry about dropping the device on the bathroom floor! 3. Food-grade polymer material. Our food-grade polymer material is safe for skin contact, easily cleaned, and resists tape adhesive buildup. 4. Swiveling stainless steel bail : Eliminates the spring binder clips used with homemade 35mm film canisters. All metal parts are fabricated from stainless steel. 5. Sturdy construction: Rugged design will last for years of tugging. 6. Tape Retaining Ridge: Small ridge on edge of canister keeps tape from sliding off. 1. All day long comfort, apply device in morning and forget about it until night-time. No pinching, no pain. 2. Never comes off until you want to take it off, avoids embarrassing situations. 3. Precise & repeatable placement of skin on device, consistent tugging. 4. No need to remove & reapply the device to urinate. Important if you are going to wear it all day long. Novice restorers use the Super Canister because initially novices do not have enough slack skin for tapeless devices to work. The large opening allows the glans to recess inside the device, and places the device closer to the skin. This model is now available in 3 sizes. To check your size, wrap a strip of paper around your glans in the flaccid state. Mark the paper where it overlaps for one complete wrap, and measure the length. 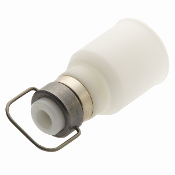 If the circumference is up to 3.9" (99mm) order the 1.1" (28mm) diameter (LARGE) Supercanister. (This most closely duplicates the dimensions of the home made 35mm film canister tuggers.) This size will be suitable for most men. If the circumference is up to 3.9 - 4.3" (99 - 109mm) order the 1.25" (32mm) diameter (XTRA-LARGE)Supercanister. If the circumference is over 4.3" (109mm) order the 1.4" (35.5mm) diameter (2XL) Supercanister. Keep in mind the glans doesn't need to fit entirely inside the canister. The skin will stretch wider as needed. Don't oversize the canister. Supercanister Instructions can be downloaded here (PDF file). Additional restoration tape is available in our store. The Super Canister requires use of clip on suspender strap or weights not included. Supercanister is white color. Copyright © 2010-2019 Foreskin-Restoration.Info. All rights reserved. FDA Disclaimer: The statements and products shown on this website have not been evaluated by the US Food and Drug Administration. These products are not intended to prevent, treat or cure any disease. The information provided by Foreskin-Restoration.info or Advanced Devices is for educational purposes only and is not intended as a substitute for professional medical advice, diagnosis, or treatment. Always seek professional medical advice from your physician or other qualified healthcare provider with any questions you may have regarding a medical condition. Join our mailing list to get the latest product introductions and sales specials on foreskin restoration devices from ADI.